World War II (WWII), also known as the Second World War, was a global war which took place between 1939 to 1945. World War II (WWII), also known as the Second World War, was a global war which took place between 1939 to 1945. 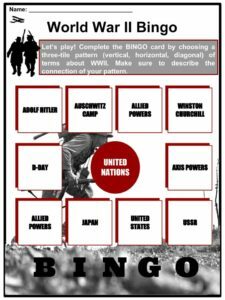 Most of the world’s countries, including all of the great powers, fought as part of two military alliances: the Allies and the Axis. 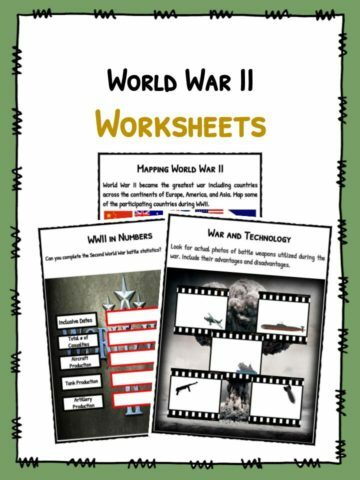 See the fact file below for more information on the World War II or alternatively, you can download our 21-page World War II worksheet pack to utilise within the classroom or home environment. 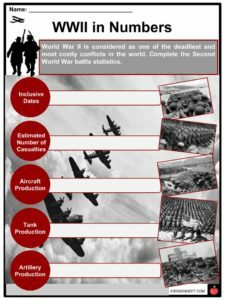 World War II was a military conflict that lasted from 1939 to 1945 and involved nearly all the nations of the world. It was caused by the Treaty of Versailles and the German people’s resentment toward the League of Nations. The Treaty of Versailles was created in 1919 to ensure peace in Europe following World War I. The treaty said that land was to be taken away from Germany. It also stated that Germany would pay for damages caused by the war, and could only have a small army with no air force, submarines, or tanks. Adolf Hitler was able to convince the German people to give him the power to improve conditions in Germany and restore the country’s strength and dignity. He vowed to tear up the Treaty of Versailles. Hitler began invading Austria and Czechoslovakia. He also built up the German army and its weapons. On September 1, 1939, Germany invaded Poland. When that happened, Britain and France declared war on Germany. Germany made treaties with Italy and Japan. The three became the Axis powers. Leaders of the Axis powers were Adolf Hitler, Emperor Hirohito, and Benito Mussolini. The countries that made up the Allied powers included Russia, France, British Empire, United States, Romania, Serbia, Belgium, Greece, Portugal, and Montenegro. 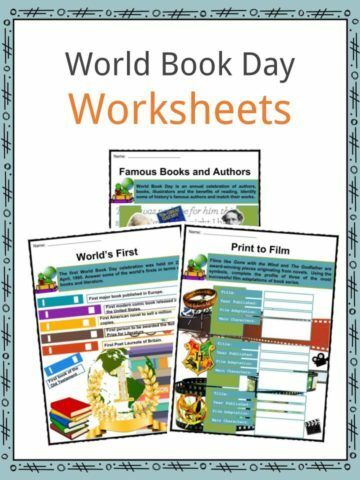 Major leaders of the Allies were Joseph Stalin, Franklin D. Roosevelt, and Winston Churchill. In the Battle of Britain, the Royal Air Force known as the RAF defeated the German Air Force, known as the Luftwaffe. As a result, Hitler halted his plan to invade Britain. By 1941, the US Congress passed the Lend-Lease Act which provided aid to Great Britain. In June 1941, Hitler launched Operation Barbarossa which ordered the German invasion of the Soviet Union. At the same time, the Final Solution or extermination of the Jewish race was also introduced by Hitler. On December 7, 1941, World War II awakened the Pacific after 360 Japanese aircraft attacked Pearl Harbor located in the islands of Hawaii. The following day, the US Congress and President Franklin D. Roosevelt officially declared war against Germany and Japan. The Allies dropped 3.4 million tons of bombs, averaging about 27,700 tons of bombs each month. On August 6, 1945, the United States dropped an atomic bomb on Hiroshima, Japan. A B29 Superfortress bomber, called the ‘Enola Gay’ dropped the bomb. On August 9, 1945, another atomic bomb was dropped on Nagasaki, Japan. Over 225,000 people were killed or later died from radiation poisoning in both of these attacks. These attacks virtually ended the war with Japan. On June 6, 1944, combined Allied forces invaded Normandy, France and began to liberate territories held by Germany. Hitler’s army fought with the Soviet, British, American, French, and Canadian forces, and faced defeat in the event now known as D-Day. After the Battle of the Bulge, Allied forces invaded Germany in February 1945. Adolf Hitler committed suicide on April 30, 1945. Germany surrendered on May 8, 1945. On August 14, 1945, Japan surrendered. 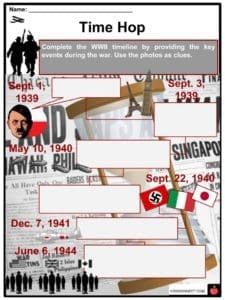 World War II ended on August 15, 1945. 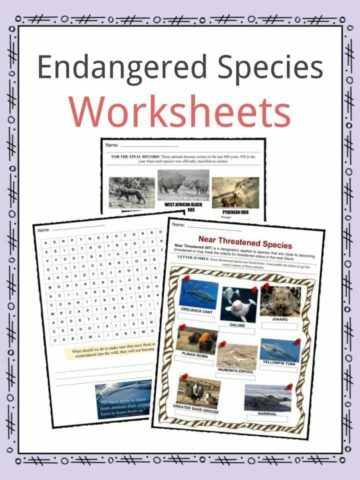 The war was not officially over until President Harry Truman issued a “proclamation of formal cessation of World War II hostilities”. This occurred on December 31, 1946. 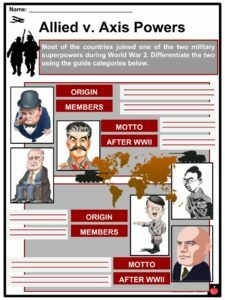 After the German defeat, the Big Three – British Prime Minister Winston Churchill, US President Franklin Roosevelt, and Soviet Premier Joseph Stalin met at the Yalta Conference to come up with an agreement on how to deal with Germany. It was followed by the Potsdam Conference attended by British Prime Minister Attlee, US President Truman, and Soviet Premier Stalin. The United Nations replaced the League of Nations after the war. Until today, UN guides the member countries to uphold human rights, peace, and tolerance. WWII started in Europe on September 1, 1939, when Nazi Germany invaded Poland. US President Franklin Roosevelt led the “We Can Do it” campaign urging single and married women to join the workforce. The former USSR (Russia) lost over 21 million people as war casualties. Nearly 6 million Jews died in the Holocaust while millions became refugees to countries such as the Philippines. Dr. Josef Mengele, also known as the Angel of Death, killed more than 2,800 twins because of his experiments. Anne Frank and her sister died at the Bergen-Belsen camp one month before the liberation. During WWII, hamburgers in America were called “Liberty Steaks” to avoid the German name. 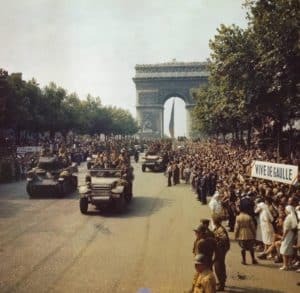 Liberation of Paris, August 1944. 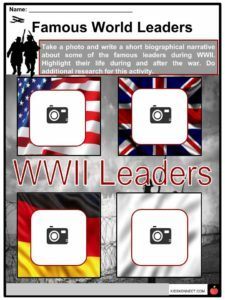 This is a fantastic bundle which includes everything you need to know about World War II across 21 in-depth pages. 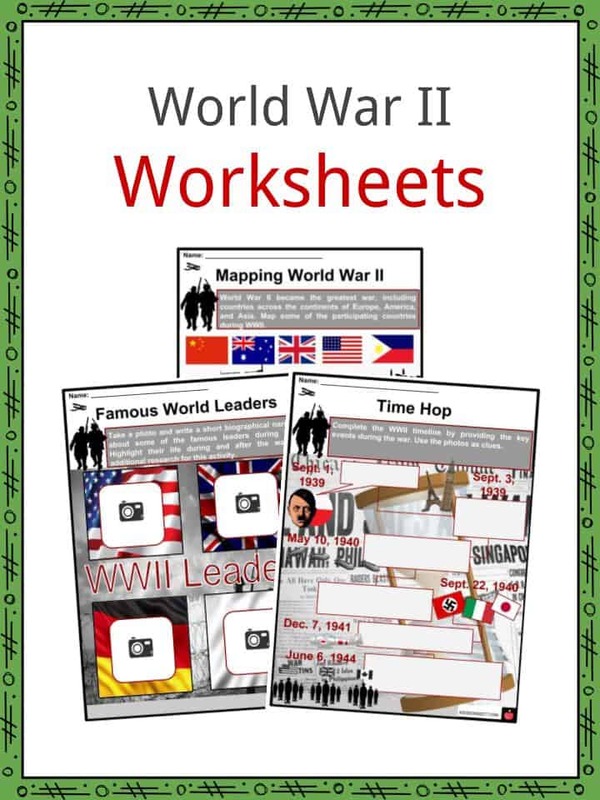 These are ready-to-use World War II worksheets that are perfect for teaching students about the World War II (WWII), also known as the Second World War, which was a global war which took place between 1939 to 1945. 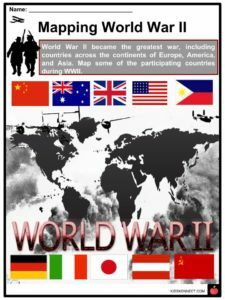 Most of the world’s countries, including all of the great powers, fought as part of two military alliances: the Allies and the Axis.